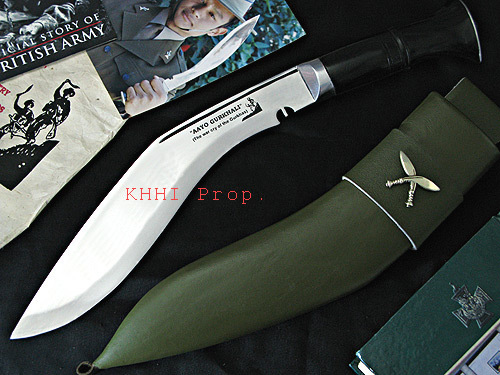 Make your kukri knife more functional, look more better, attractive and beautiful with these add-ons. 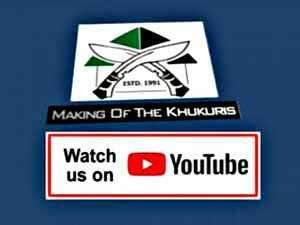 Starting 2018, KHHI started this new feature in the website. 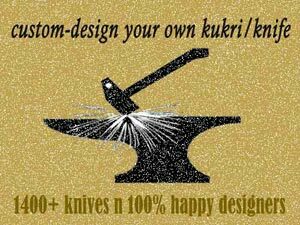 Now, you can easily choose the available addons on each kukri knives while purchasing our kukris online. 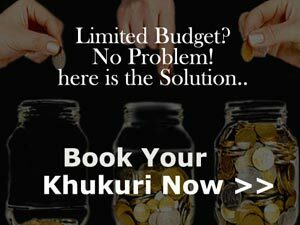 Its available in applicable khukuris/ knives only. 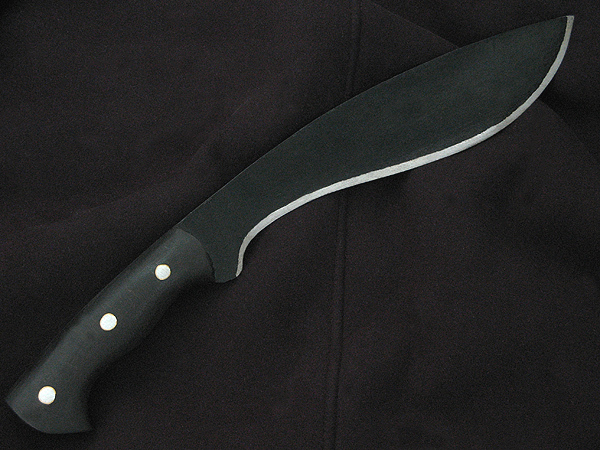 Chisel Tip: Tip of the kukri/knife is grinded in one side only like a chisel in order to make it strong and durable. The outcome is a very powerful tip that can withstand brutal stabbing and even digging. 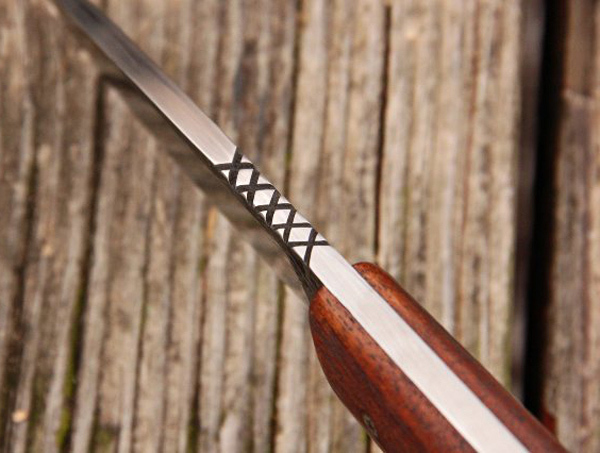 Ridges in the Handle: Rings and ridges are made all over the handle to provide a non-slippery and very sturdy grip in the handle. 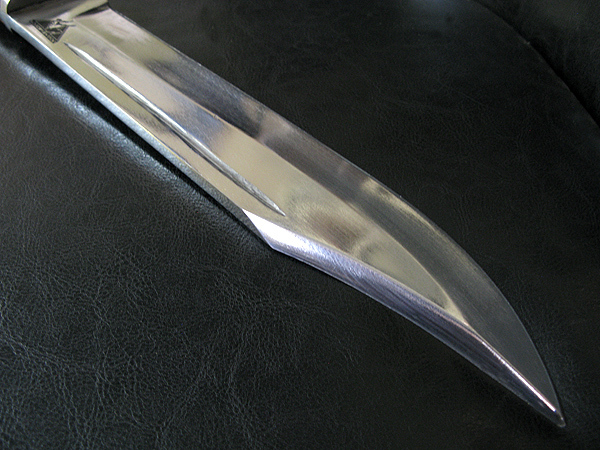 It will not only enhance appropriate holding and comfortable grip but also make the handle look nice. 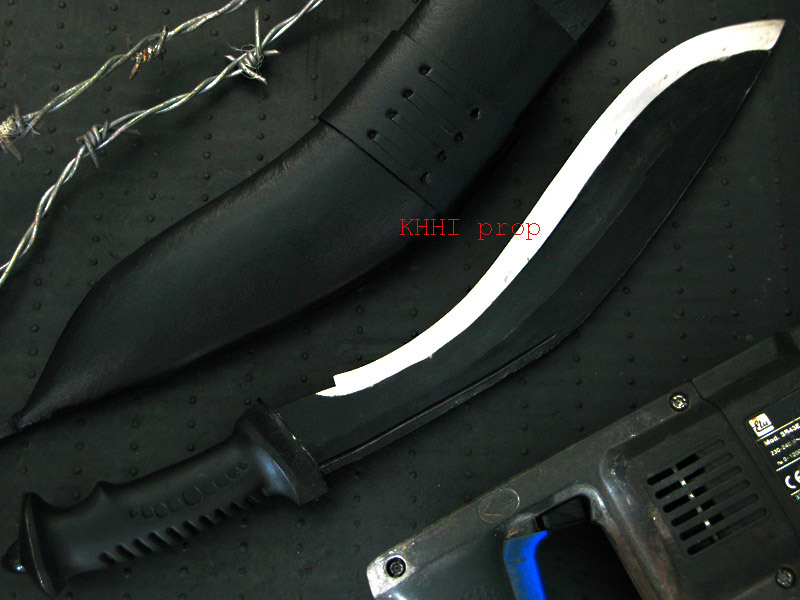 Black chemical Coat: In order to tackle the rust issue of a high carbon steel BCC (black chemical coat) is offered by KHHI nepal. 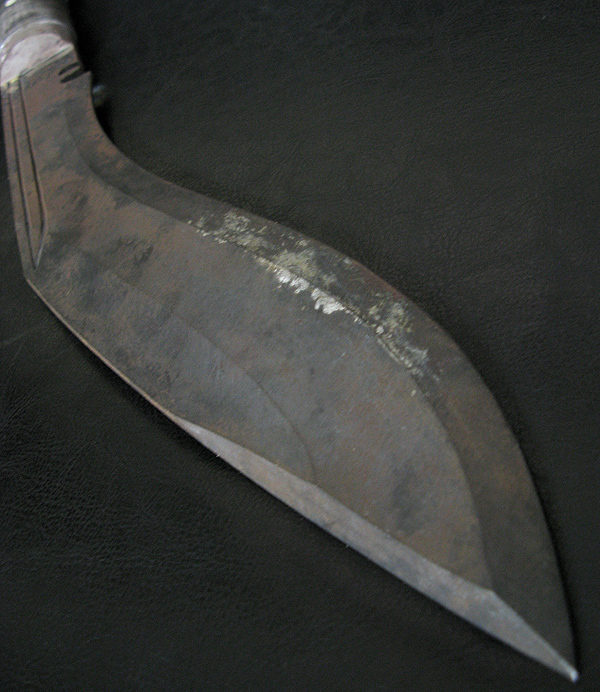 This prevents the blade from rusting (oxidizing) and gives a fine uniform finishing to the blade. However the bevel and spine are ignored since these parts get heavy wear and tear and thus the coat might come off. L-Key set up: This kind of set up in handle is recommended for heavy duty work. 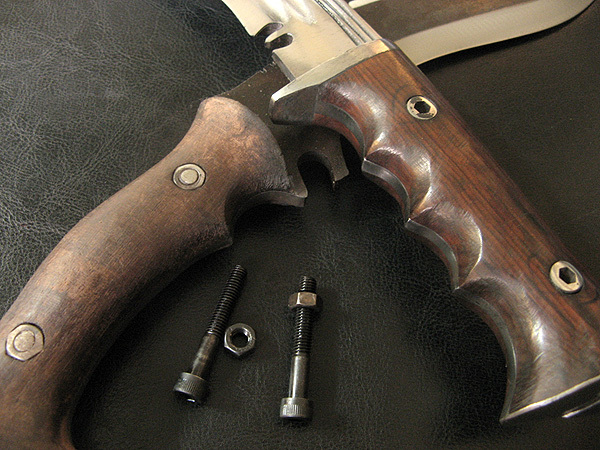 Instead of the regular rivets/pins L-Key knot bolt is used along with high standard epoxy to attach the handle scales to the tang. The bond is super strong and will last a lifetime. 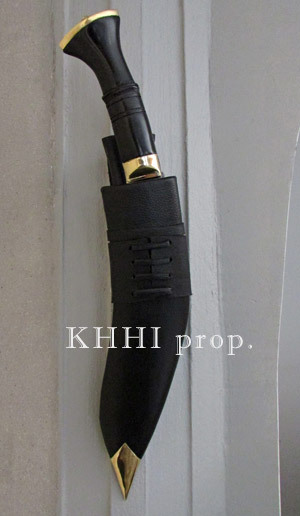 KHHI is very proud to initiate this type of fixture in the khukuri community (market) for the first time ever. Lanyard hole in Handle: Small but important feature that comes pretty handy for any users. A see-through hole at the end of the handle is made that allows a leather cord/thong to go thru and the same cord goes around the wrist. 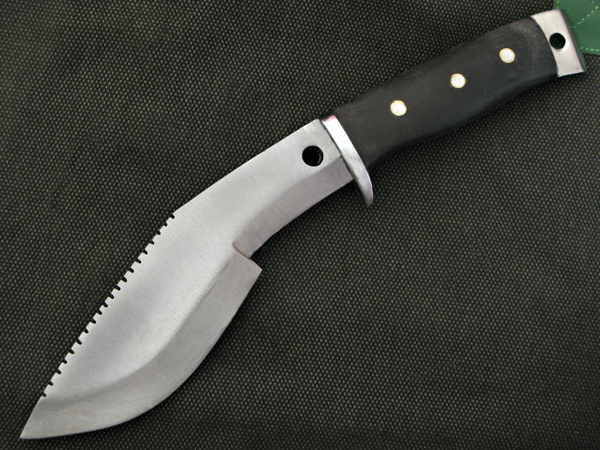 By doing so the knife is prevented from dropping even in slippery and wet conditions. Your knife will always be yours within your reach. 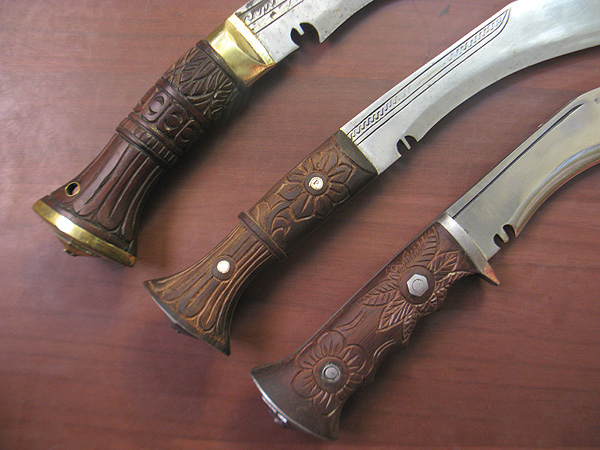 Carving in Handle: Extra feature executed to decorate and adorn a kukri/knife. 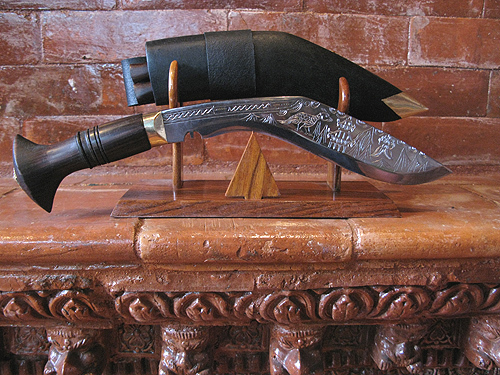 Wooden handle is hand carved with various traditional designs/patterns by our Dragon man. The carving is primary done for show and beautification of the handle. 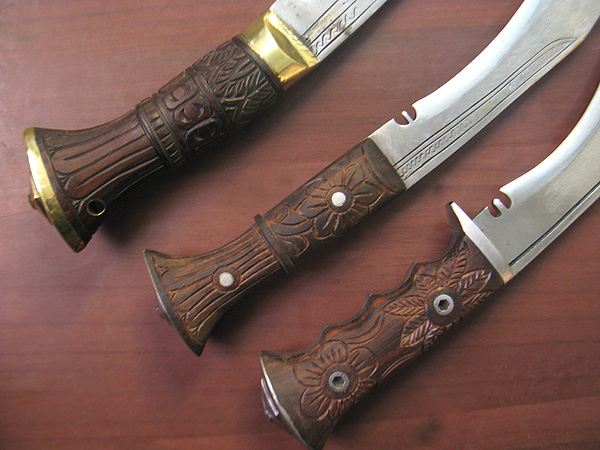 Various traditional patters are carved that best suits the wooden handle. Cross Badge in Frog: A special add-ons that is a part of decoration and to boost the “Gurkhali” touch/feeling as a whole. 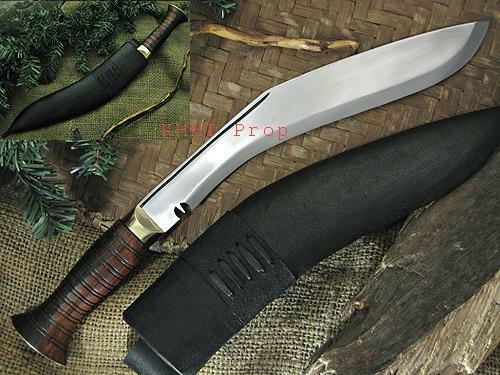 The legendary cross khukuri insignia of the Gurkhas is mounted on the frog of the sheath to make the overall look of the khukuri more attractive and distinct. This handmade insignia made from white metal can also be used as a wearable item. Strap Button: A small but smart thing to do that makes carrying so much easy and comfortable. A strap button is fitted in the frog to tie the handle to the frog. 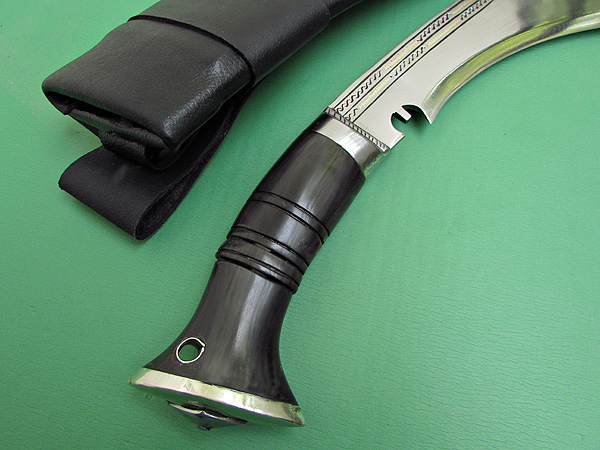 This makes the handle stay close to the sheath vertically and thus the kukri does not fall sideways and wobble while carrying. Strap button works the best with the kukris/knives that come with very heavy handle. 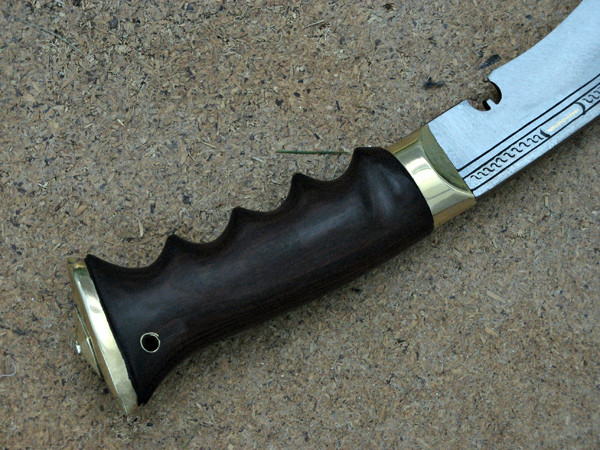 Zimping in Spine: Small cuts along the spine of the blade to facilitate thumb grip and thus better balance for close cutting (slicing) is the Zimping. It provides good rest for the thumb so the user gets good balance and control over slicing, peeling and cutting. The zimping can also be used to bend/twist wires and hard cords, strings etc. 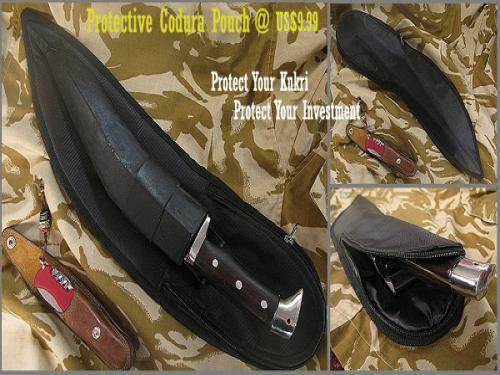 A useful add-on that will protect your beloved kukri and your hard earned investment. 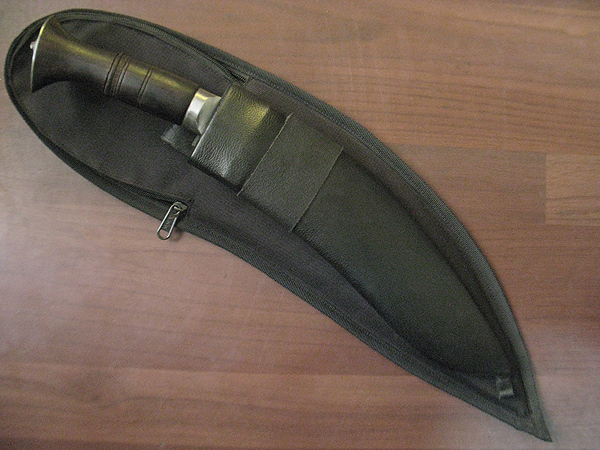 This carrying pouch made from codura and pads is made for extra protection for your kukri/knife. 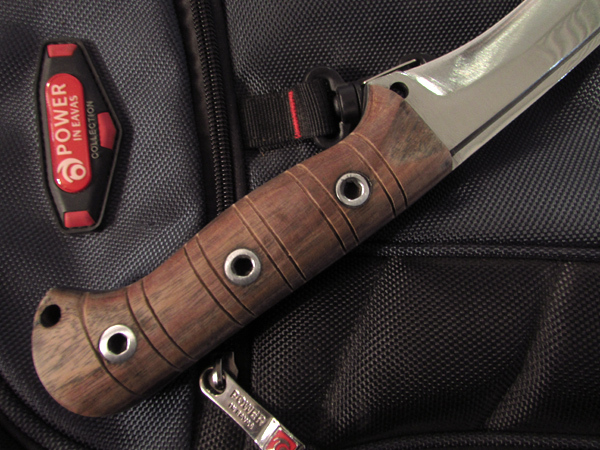 It comes handy and useful when you plan to travel a lot with your knife. It is also water resistant so safe guards your knife from spills, liquids, fluids etc. 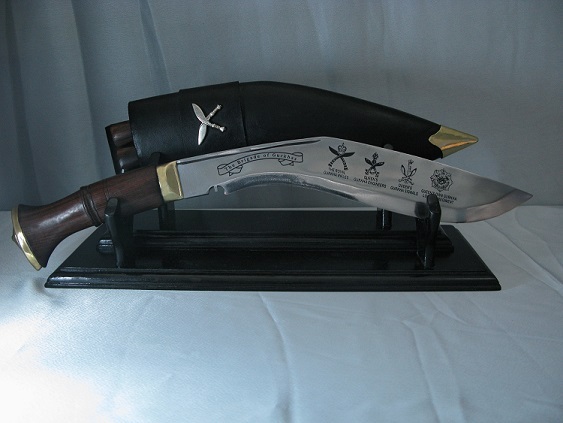 A perfect method to display or keep your kukri in a safe way. 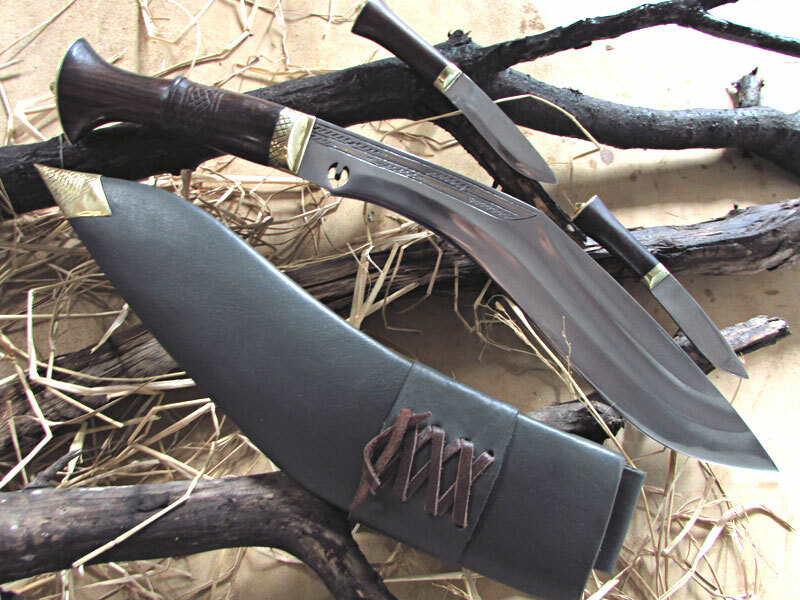 You can either display both the blade and sheath separately OR display together with the blade tucked inside the sheath for safety purpose. A pair of screw is used to fasten the wooden pieces together and can also be dismantled by unscrewing. This whole stand comes flat and hence is very easy to carry or transport. The double mounted stand is handmade by using only conventional domestic tools. It is made from treated wood famously known in Nepal as the “Seesau” or furniture wood commonly. 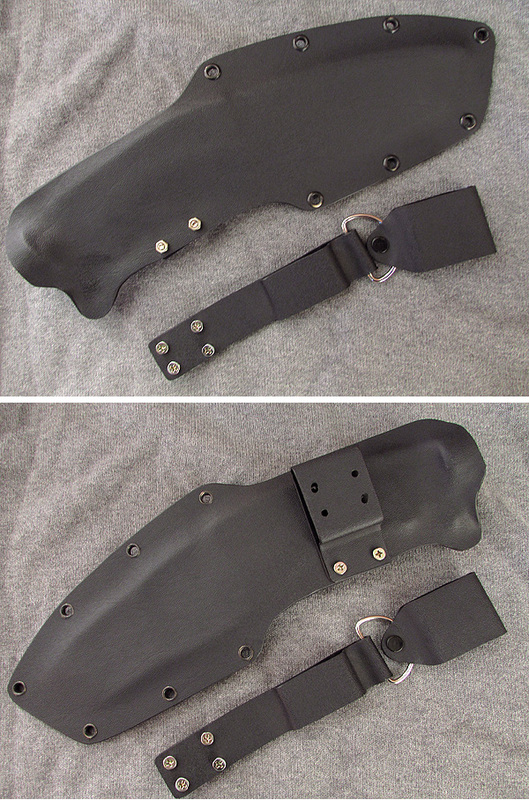 KYDEX sheath: A very important and useful add-ons to have for any product. 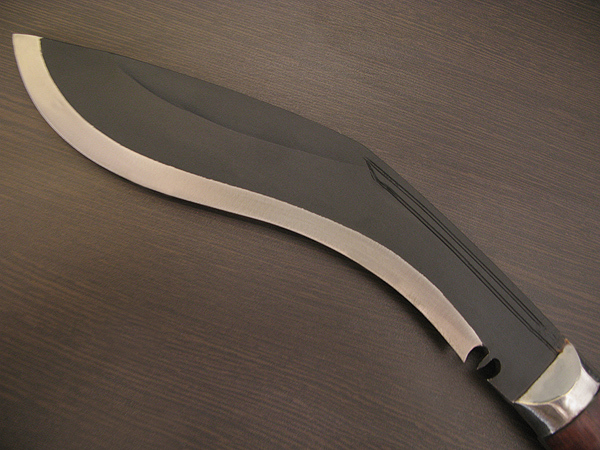 It will not only enhance the function and usefulness of the kukri/knife but add efficiency and beauty to the blade at the same time. This hard coated plastic material gives a perfect and comfortable carriage and is completely water resistance which is its biggest advantage. 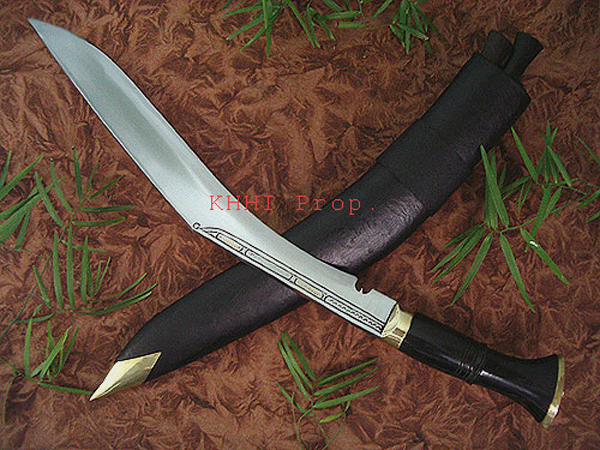 This type of modern sheath is one great replacement of the traditional and western leather sheath. 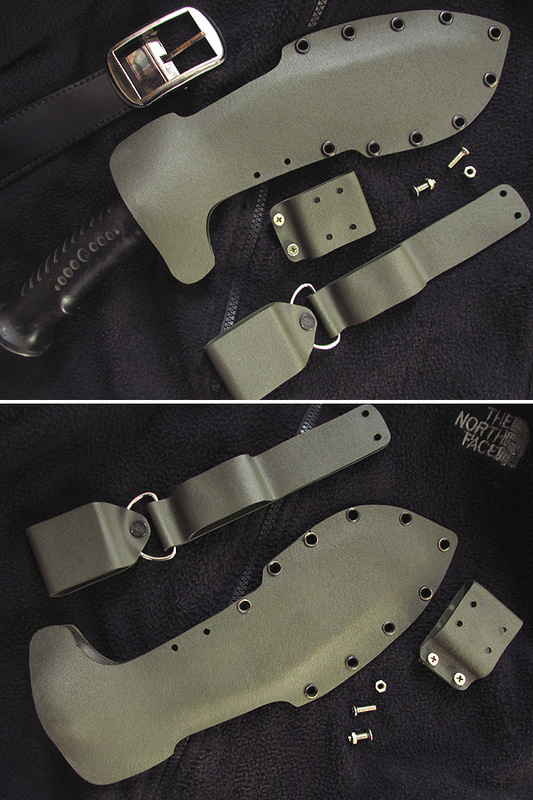 Kydex sheath is lighter, less-bulky, durable, comfortable to handle and is compatible to various army/trekking wears and kits. It is available in black, coyote tan and army green color. Wall Hanger: A small but interesting add-ons that lets you hang your knife on the wall or any erect object. To make this buy unique we have used the traditional JUTE thread that is widely used all over in Nepal from plain sides to hilly regions (south to north). Most Nepalese live in rural and like the khukuri jute thread plays an important role to performing their daily domestic activities. 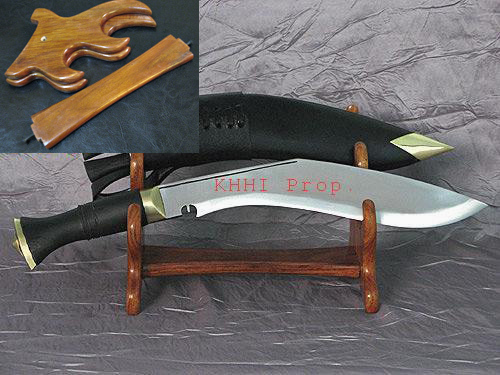 When you do not have a stand or rack then you can simply hang your knife/kukris where it’s feasible to display or store. It’s a good and safe way to display which also adorns the whole ambient. 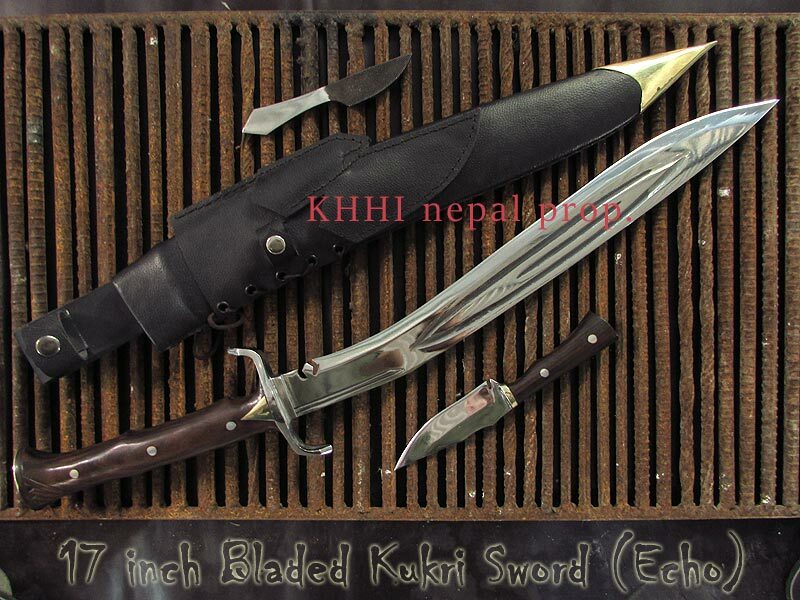 IMP NOTE: when you hang the knife/kukri for a long time then make sure the blade is heavily oiled so rust does not develop..
Nepal Flag patch: National flag of Nepal is as unique as its beauty and people. It is the only triangular flag in the world. The flag has upper and lower triangles where lower triangle is bit larger than the upper. The color red depicts the victory and bravery while blue color signifies peace and harmony. The moon and the sun are said to be there to express the strong belief that Nepal would last as long the Sun and Moon are up in the sky. This pride of Nepal has been added in the “Add-Ons” segment to introduce one pride with the other and to further boost the segment. 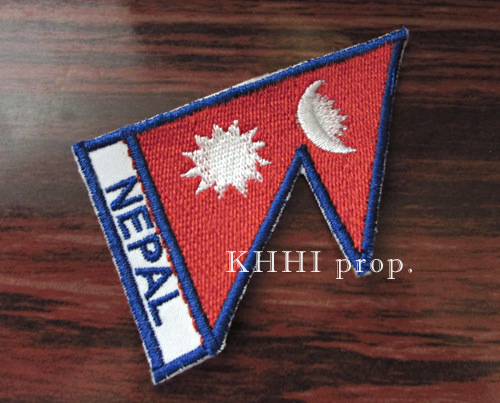 The hand embroidery Nepal flag patch is completely hand sewn and can be stitched anywhere in hat, shirt or any cloths anywhere. It is 75 (height) x 45 (breadth) mm approx. in size. It is entirely made from cotton threads. 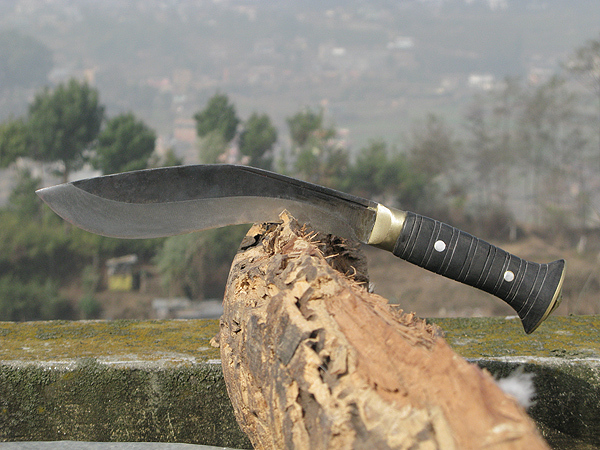 The combination of the unique Nepal flag and the glorious kukri adds beauty, joy and memory for a life time. Post Cards From Nepal: Remembering your near ones when far away is inevitable. Sending postcards to friends, family, or loved ones during travel can be a great way to show your affection, as well as giving people an idea of where you are. Postcards are not only limited to this but one can have it as a remembrance of the country/place visited or would like to visit in future. These post cards reflect Nepal and her persona. The rural, hills, mountains and the people are inimitable and something to have close to your heart. Button Frog: An extra touch to the regular frog which facilitates carriage of a kukri/knife without even untying the belt from waist … Brass buttons that are fitted in frog allows the belt loop to fasten/unfasten to fit in a belt. The typical frog in which a user has to take off his belt to take off the kukri/knife is permanently solved by this new Button Frog. 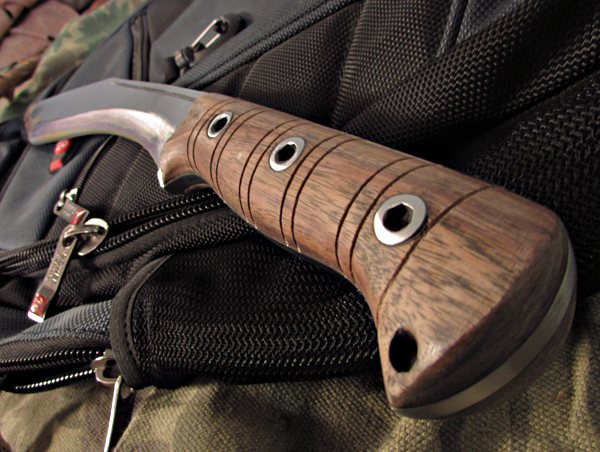 3Ply Frog: An improved frog (belt loop holder) that enables the user (carrier) to carry his kukri/knife in 3 different ways from his waist and hence named as “3ply Frog”. 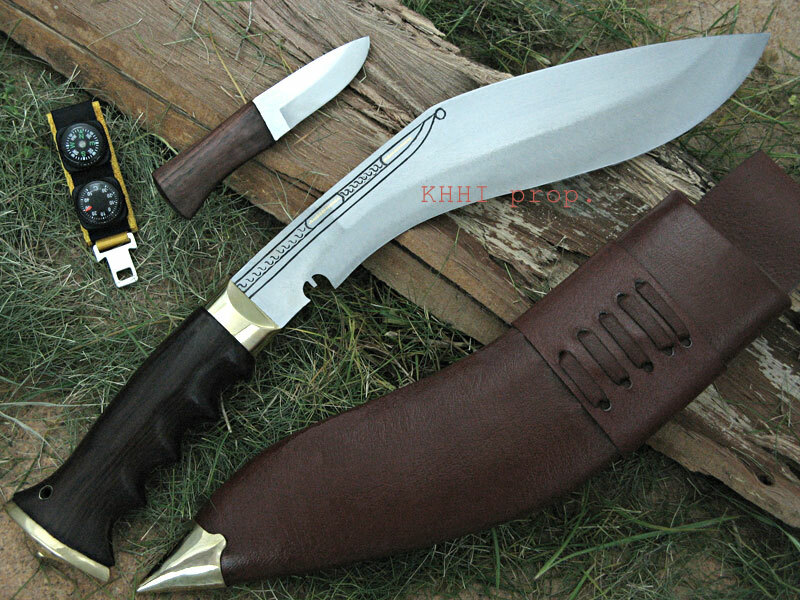 With the frog fitted to the sheath, a user can carry the kukri/knife in vertical, horizontal and angular positions as show in the photos. 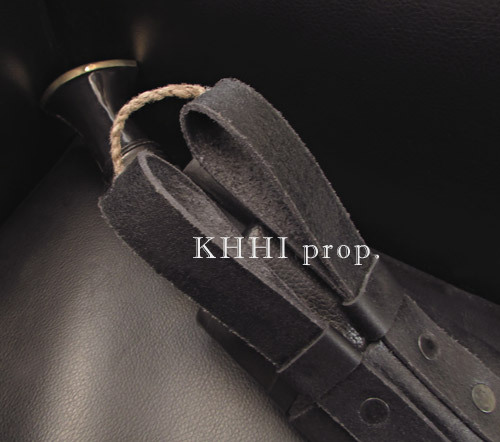 A strap butting is also fitted to the frog to prevent the kukri/knife from wobbling and for comfortable carriage. NOTE: purchasing addons will apply for additional cost, and its mentioned along wth the addons in each products.